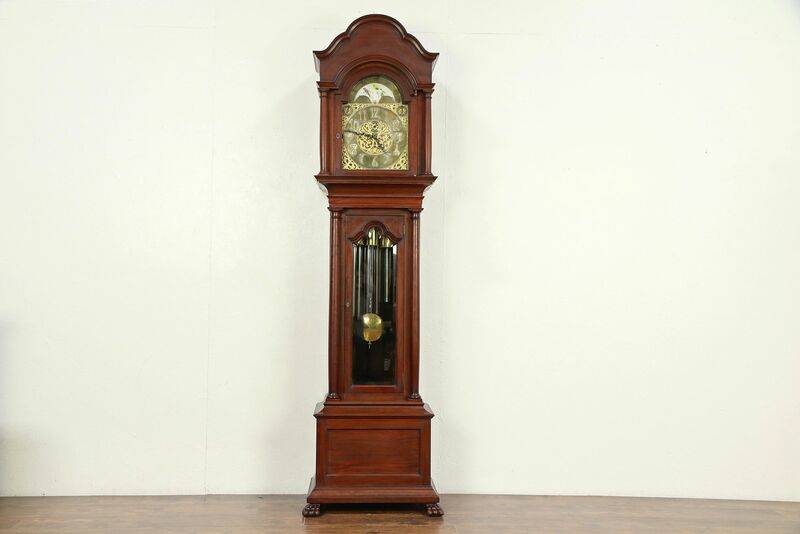 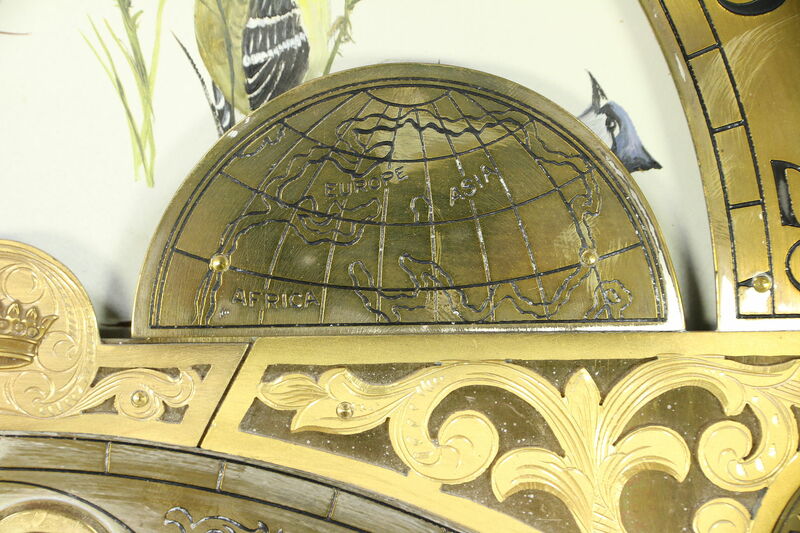 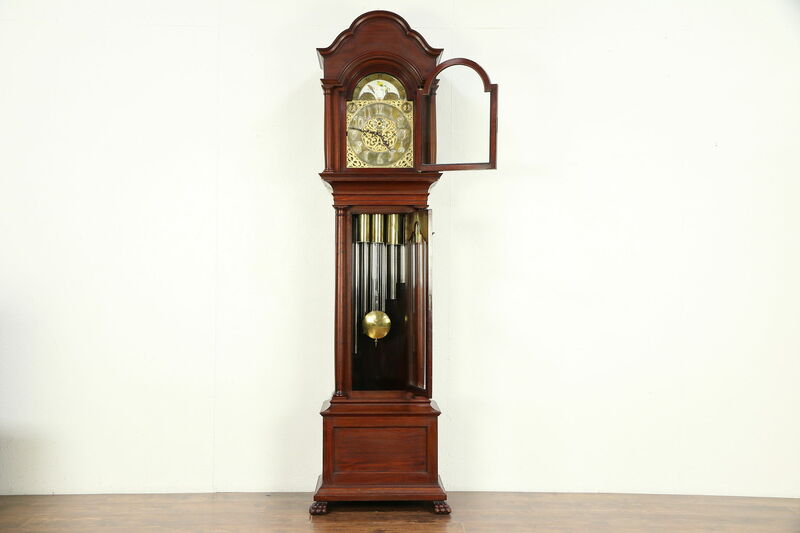 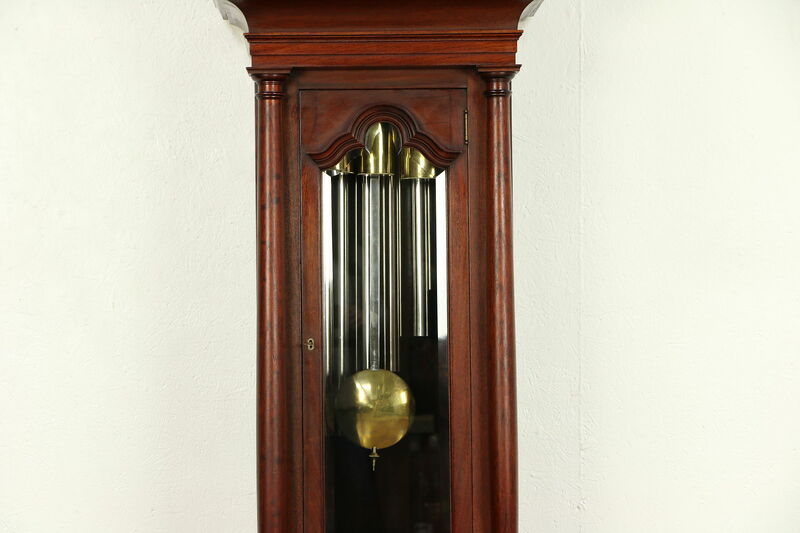 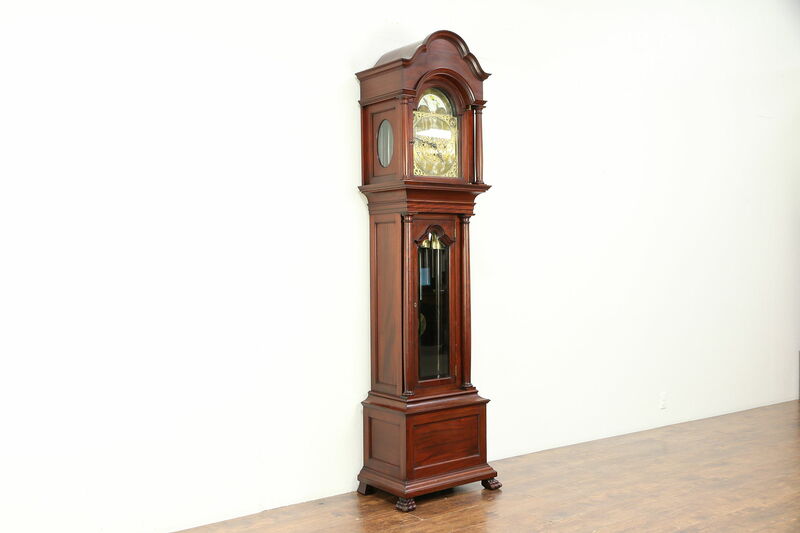 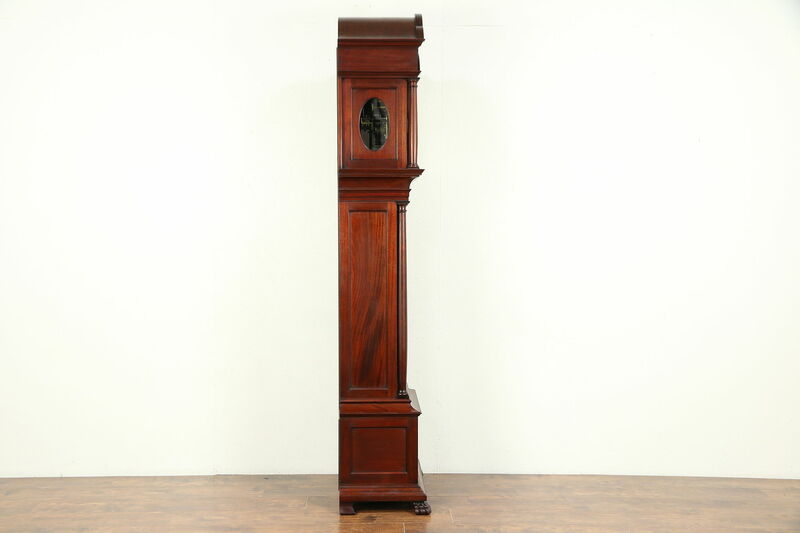 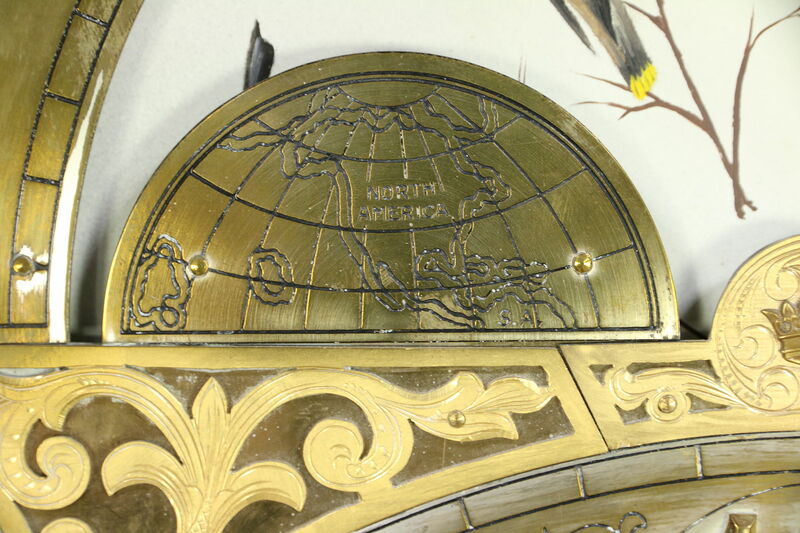 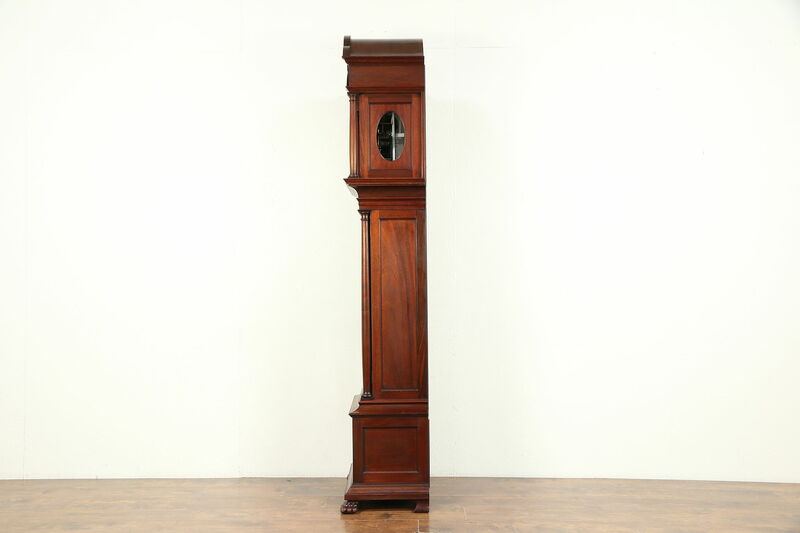 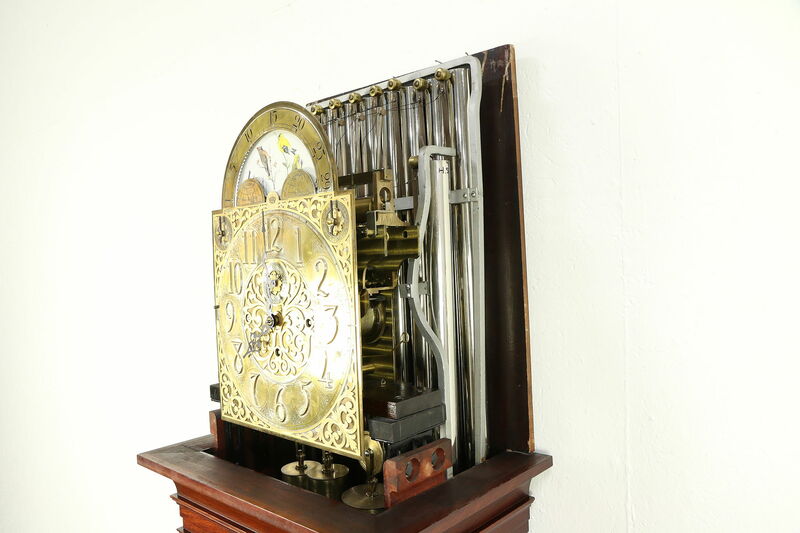 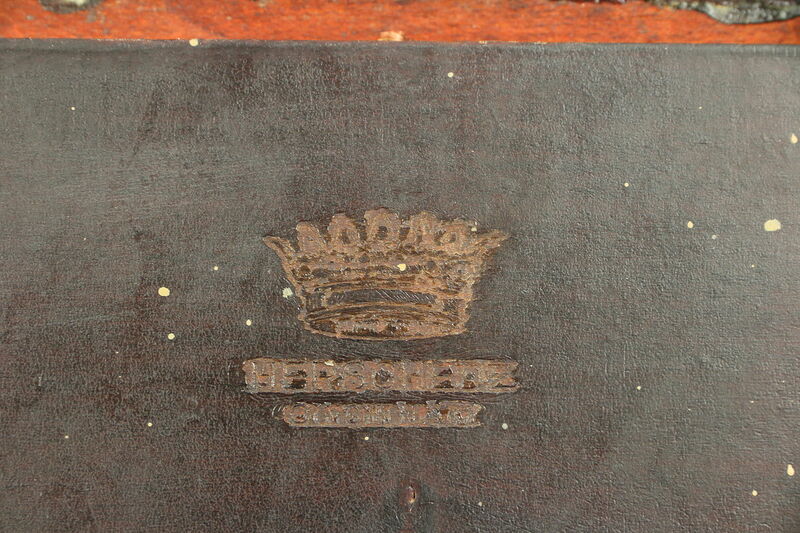 An imposing nine tube chime grandfather or long case clock from about 1910 has a signature by America's premier maker, "Herschede" of Cincinnati, Ohio. 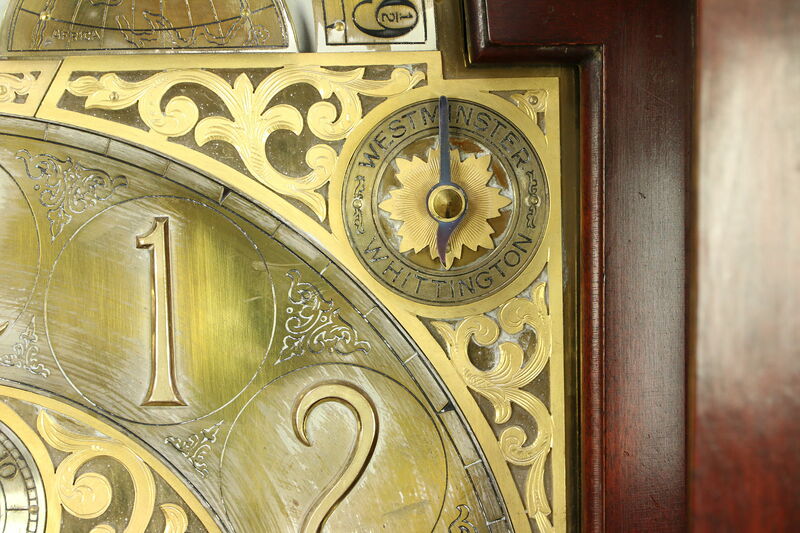 The superior quality machined brass movement keeps excellent time, chiming the familiar Westminster melody or the Whittington tune on each quarter hour and counting the hour. 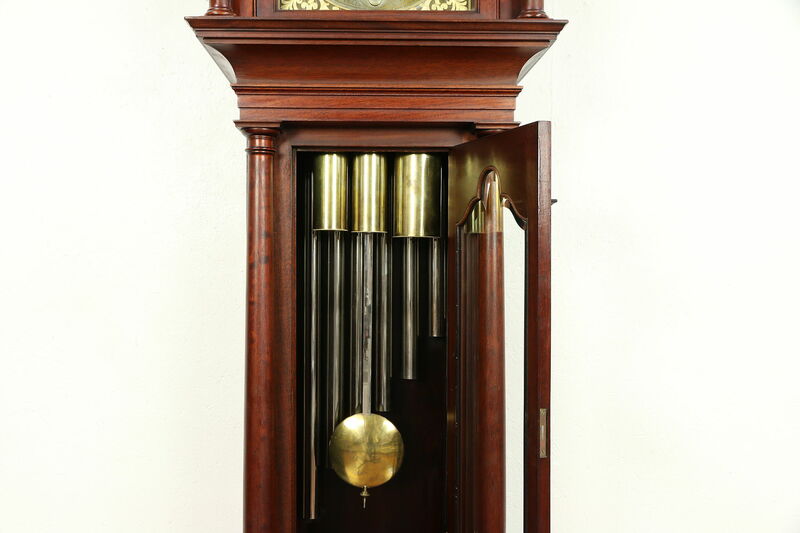 Nickel finished tubular chimes have deep resonant tone. 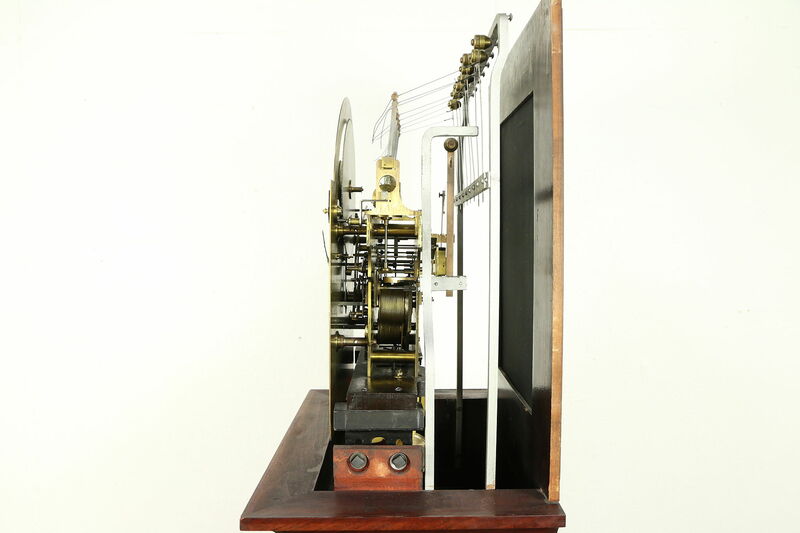 There is a silencing lever. 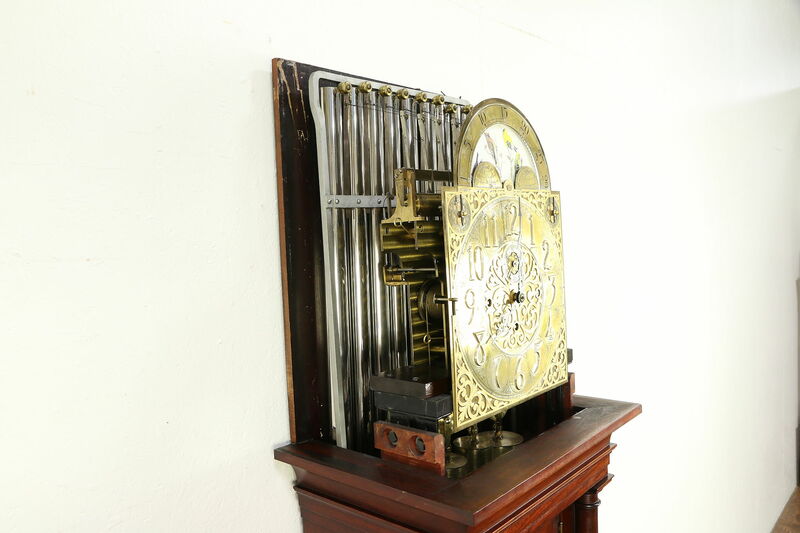 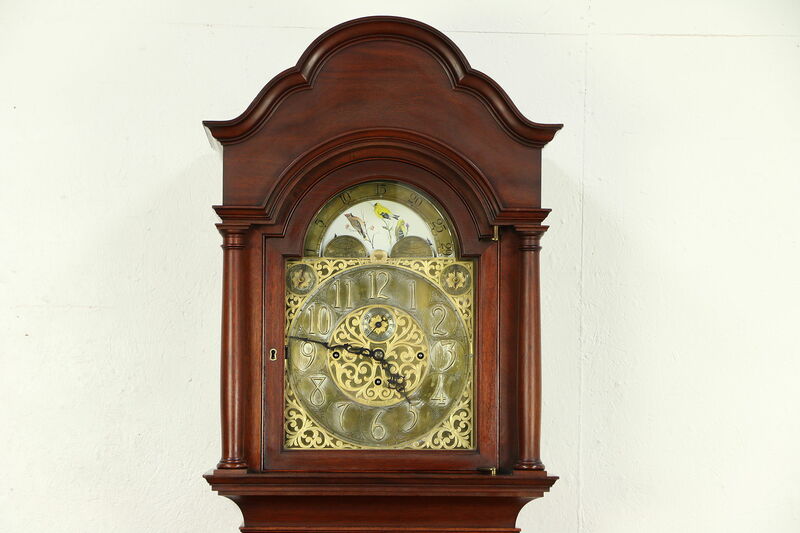 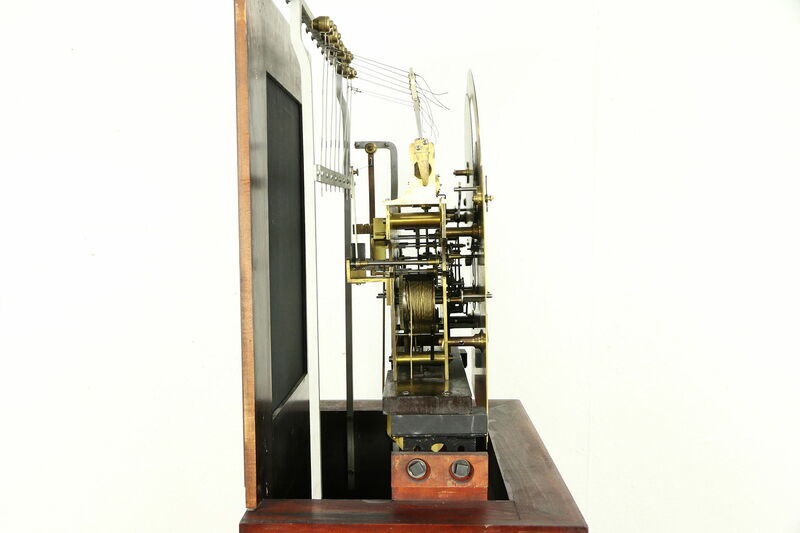 The movement runs a week on a winding, the crank is included with this American made antique clock, which has been professionally cleaned and oiled. 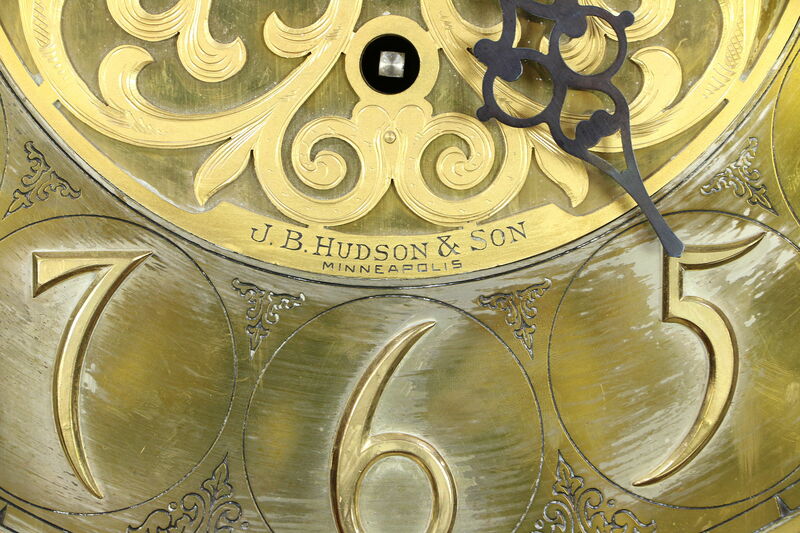 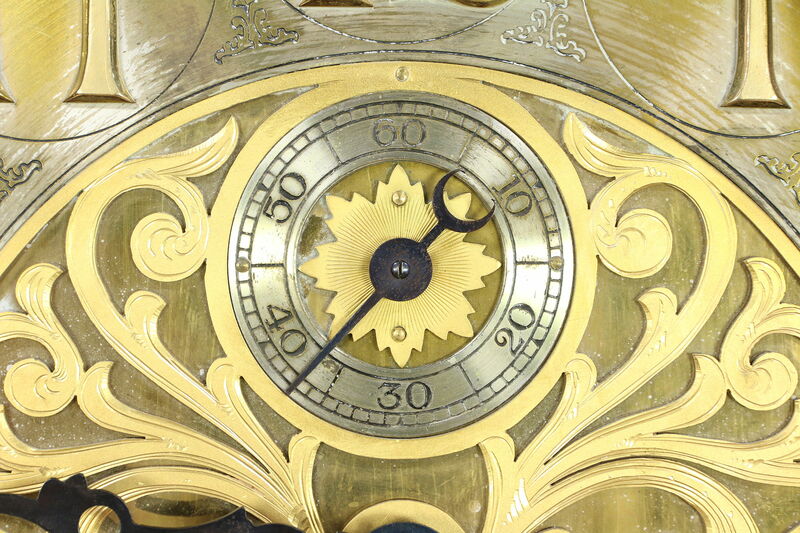 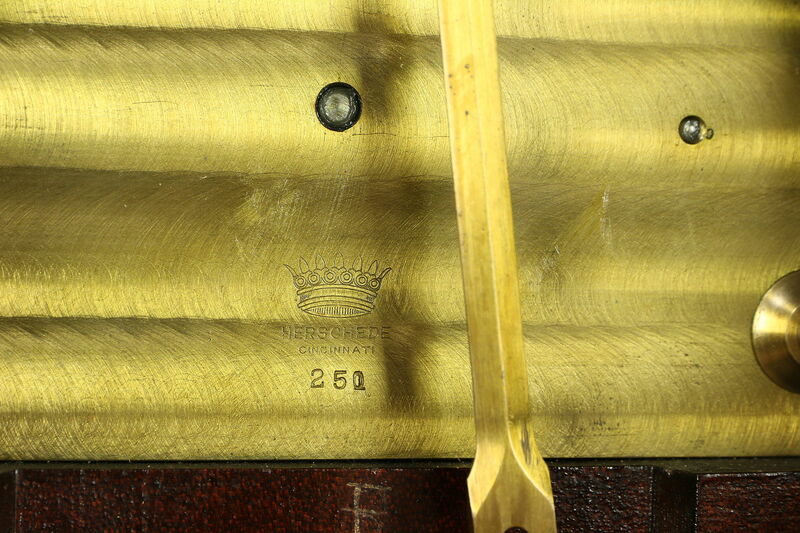 The original brass filigree dial has gold and traces of silver plating, see photos. 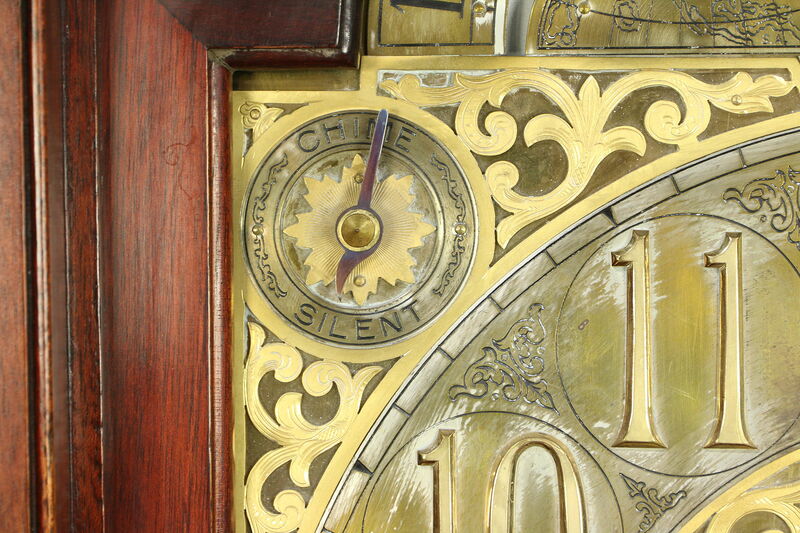 There is nice antique patina to the dial, brass weights and pendulum, all original. 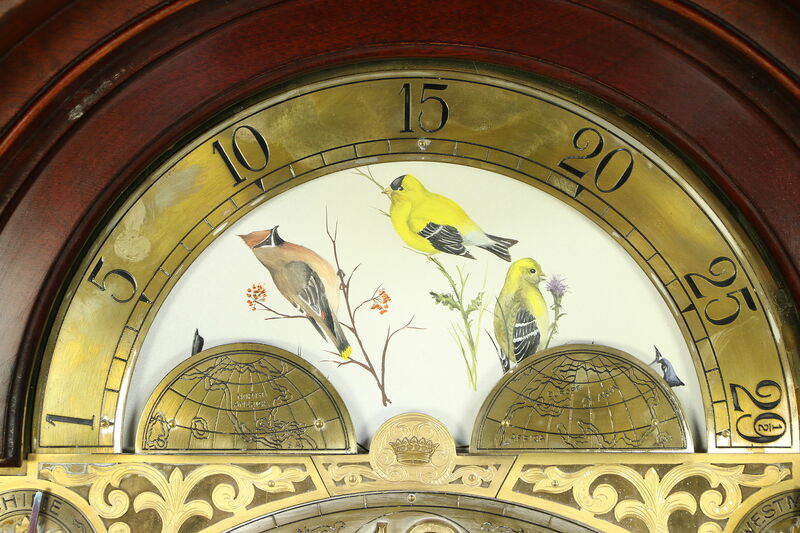 Hand painted birds are on the moon dial. 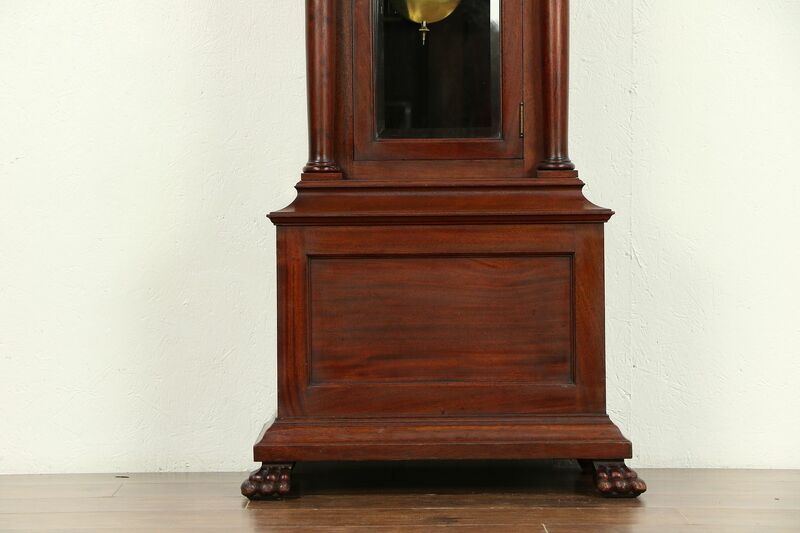 The classical mahogany case with carved paw feet has its original finish in remarkably fine condition with a little crazing and very little wear. 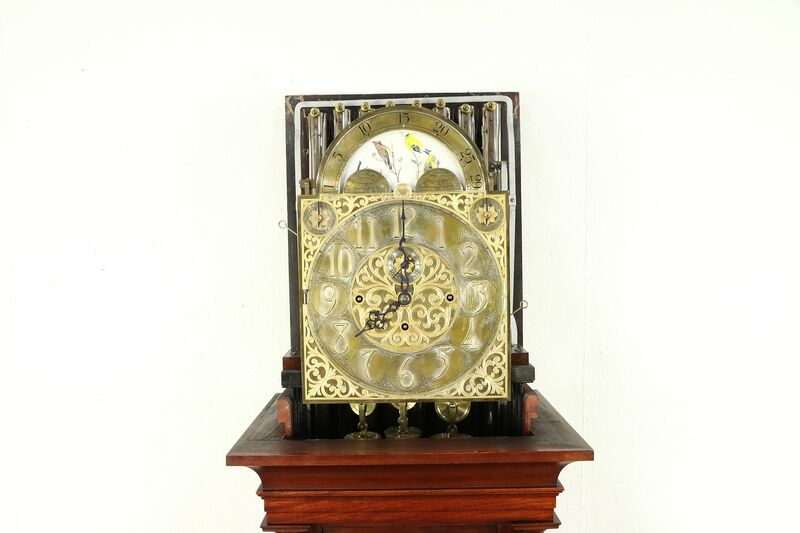 Waxed and buffed, all that is needed to maintain the antique patina is an occasional wipe with a soft dry cloth. 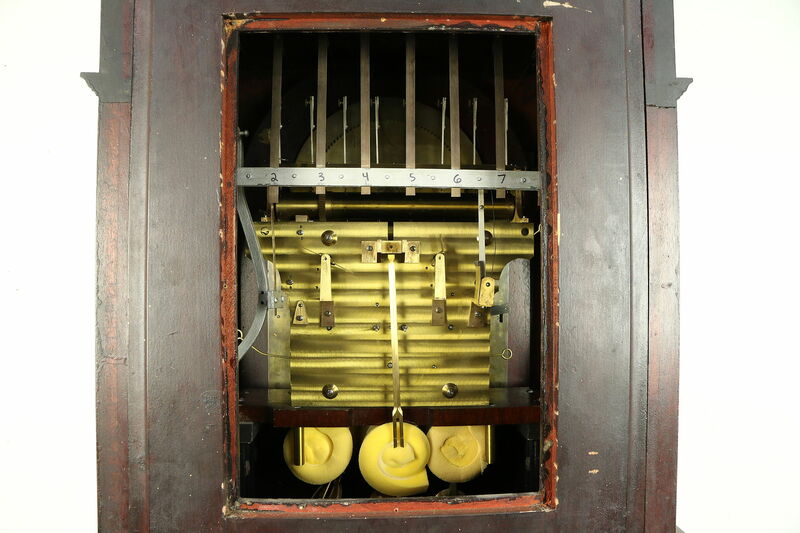 The shaped glass pane door pane is beveled, there are access doors to service the movement and hang the chime tubes. 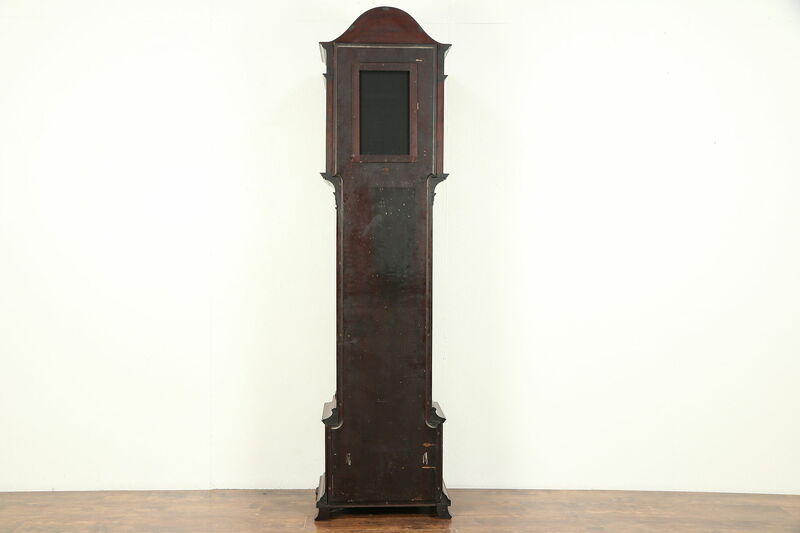 Measurements are 27" wide, 17" deep and 95" tall. 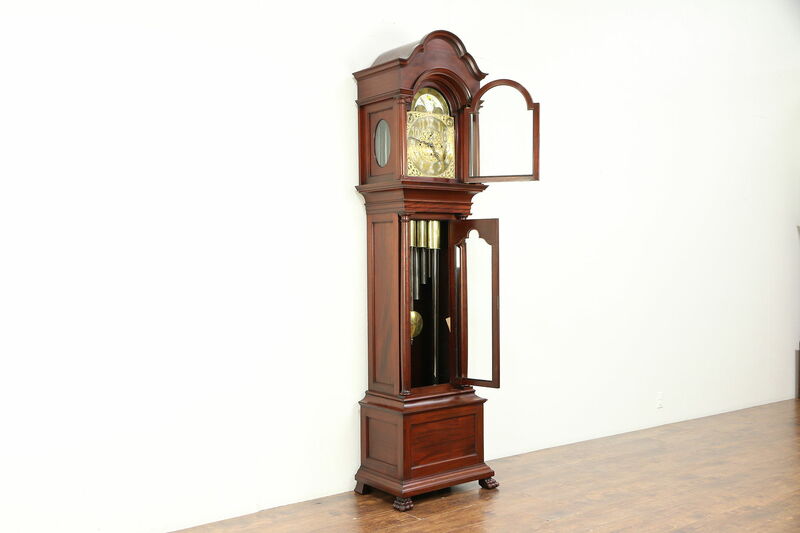 This clock needs to be "set up" when delivered - weights and pendulum attached and the case leveled. 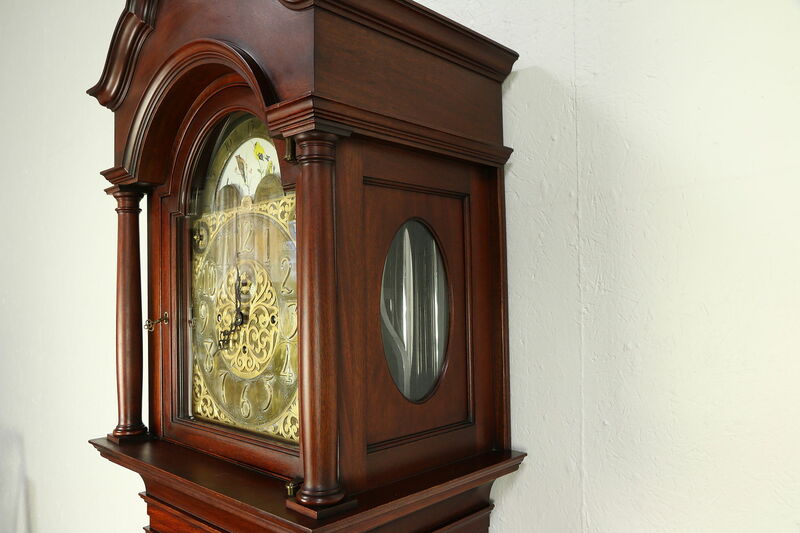 Most of our customers can do this as we walk them through the fairly simple steps by phone. 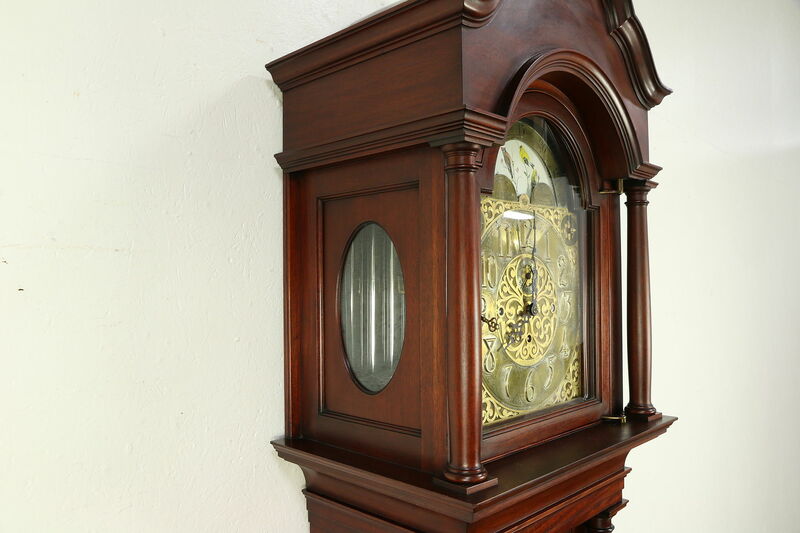 The process is not very difficult, and it is also nice to know how to do this again whenever the clock needs to be moved for cleaning, painting or whatever. 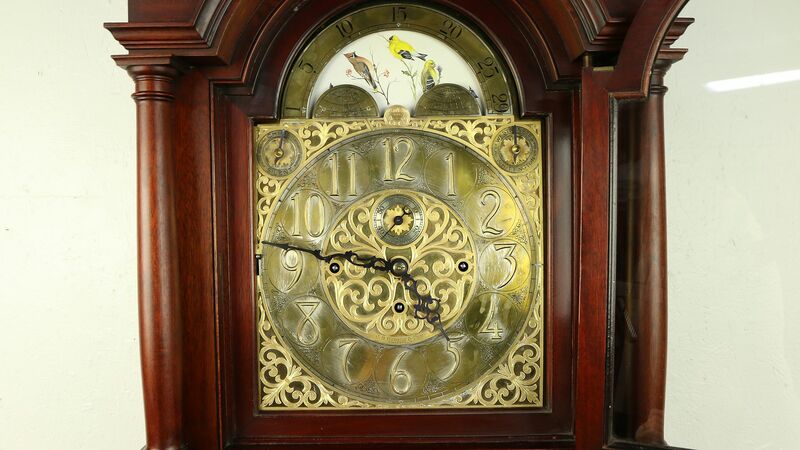 A few customers prefer to hire a local clockmaker at their own expense to make a house-call and set up the clock, which is usually not very expensive, depending on your location.